Yesterday, I wrote about bee populations in a hive that starts as a package. The original bees slowly die while the number of new bees, arising from eggs laid by the package’s queen, rapidly increases. In yesterday’s example, the immigrant bees were from New Zealand. They were a week or two old when they boarded the non-stop for Canada. Those bees began to die from overwork and age, but with a new queen, eggs were laid and new (Canadian) bees were born. Starting colonies from packages is an old, but popular, system. Especially in cold climate areas such as Canada where many bees die over winter. Every year, Canadian beekeepers import tens of thousands of cages filled with bees. Stats show that 75,000 packages were brought into the province of Alberta last year. Most arrive from New Zealand, though a generation ago, they were brought to Canada from the USA. Packages are cages, like the one above, which usually hold two pounds of worker bees and one queen. The screened cages are filled in a warm-climate, early season location, then sent by plane, train, or automobile to new owners. You may wonder how we know that each package has two pounds of bees. The packages are weighed, of course. Here is an old picture of my gang in Florida, shaking bees out of a collection cage, through a funnel, into a package which sits on a scale. When the scale hits two pounds the guy with the eye on the needle shouts “mind the doors” or something like that. For almost a hundred years, Canadian beekeepers brought truckloads of packages from the southern USA and released them into new homes in Canada. Packages were preferred because the queens were new, swarming almost never happened, the bees built up quickly, and honey crops were typically 150 pounds per hive, though some of us made closer to 300. Here’s what it looks like installing packages on the prairies. The bees in the cages on the truck are the same ones in the picture above. But here, they are 2,500 miles northwest. So, beekeepers obtain packages. They release the bees and queen in hive boxes prepared with drawn combs, honey, and pollen. Soon, some of the imported bees die. (Busy bees live around six weeks.) The queen starts to lay eggs. Not immediately, but a day or two after arrival. She can’t lay eggs in transit. Upon release, the queen’s body reacts to its new home by expanding and preparing to lay eggs. Those eggs take 21 days to develop into fuzzy young bees. In my previous blog post, I mentioned that I counted the number of bees in a friend’s queenless package hive, five weeks after it was installed. The colony had started with 6,400 bees but now there were about 1,200. Without a queen, there were no replacement bees and the little colony was doomed to die. In a normal package, new bees emerge about 22 or 23 days after the package arrives. Upon settling, the queen produces a few hundred eggs each day. The number picks up quickly as the workers clean spots for the queen to lay, pollen is collected from spring flowers, and the queen recovers from her trip. In one of my own packages this spring, I counted 16,000 brood cells on Day 17. That’s an average of 1,000 a day. Most beekeepers expect a queen to lay more than 2,000 eggs each day. At that rate, it would take just three days of egg-laying to replace the number of bees in that had started the colony. I made a chart that summarizes the population dynamics of a package. There are three lines on the graph. (If you click on the graph, you should be able to see it at a larger scale.) The yellow line starts at about 6,000 bees at the end of week 1, toward the left side of the graph and then falls to zero by week seven. That’s the population of the original package bees. 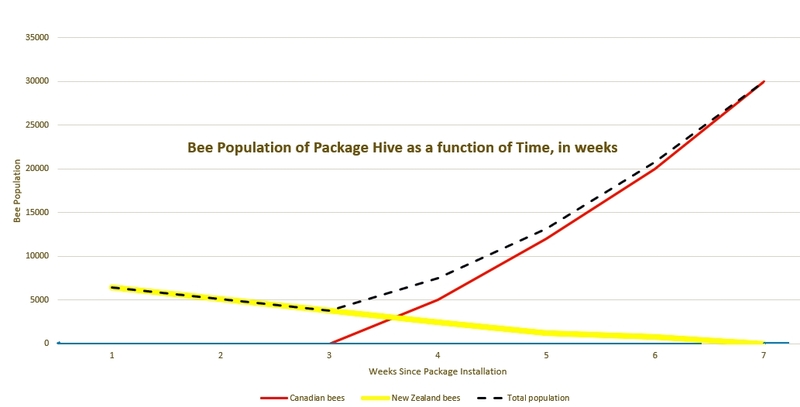 Meanwhile, the red line, which is the Canadian-born bee population, stays at zero until after the end of the third week, then adults emerge and the population grows quickly. The third (dashed) line is the total hive population from weeks 1 to 7. One thing to notice is that the bee population starts over 6,000 then goes down every day until enough new bees emerge during the third or fourth week. This is a vulnerable time for the hive. Its population is precariously low. The brood nest is expanding, the weather is cool. Meanwhile, several frames of brood must be fed and kept warm. This low-population point – between three and four weeks – is the reason that beekeepers don’t want packages to arrive too early. It’s tempting to install bees early. We think that an extra month will give a stronger colony for the main honey flow. But if it turns cold (and it usually does), brood may chill and die, flowers are sparse, and bees can’t forage. The queen’s production falters. Sometimes her anxious workers supersede her. Since egg laying is cut back, new bee emergence is curtailed while the old bee population dies off. Things may spiral out of control with the package becoming weaker and weaker. Eventually it will recover but might be less populous than a package started at a more appropriate time. Also on the chart above, you see a crossover in populations. New bees begin to outnumber the old. That’s also between three and four weeks after establishing the colony. From that point on, the hive population grows almost exponentially. In this case, you should set aside time to build honey supers. You’ll need them. This entry was posted in Beekeeping, Queens, Science and tagged Florida, package bees, queenless hives, Saskatchewan. Bookmark the permalink. Hi—as I have understood the package production system, the shaken bees are unrelated to the Queen, who is brought on in a cell raiser somewhere else, and put in before the shipping, usually in a cage. This creates a issue with acceptance by the workers, who do not have fealty to that Queen. They often supercede her almost immediately (once they have some eggs) or kill her outright. Could that have happened with the package in question? A supercedure failure or balling the Queen in transit? I don’t remember if the first story mentioned the beek seeing a queen or eggs. So, if that happens, and the supercedure is successful, the package has different genetics than what the beek paid to acquire. Susan, I produced thousands of packages and queens (in Florida) for my own honey farm (in Saskatchewan) and I can confirm that the queen and bees are not closely related. However, if the queen (in a separate cage) is put into the package as soon as it is filled with workers, she travels for two or three days with the cluster and is assimilated by installation time. I had never seen any ‘balled’ in transit. When I did this system, I lost only one or two in a hundred, even ‘quick releasing’ the queen from her cage when the bees are all set free. They were family by then. Losses were insignificant. But that was years ago, a lot has changed since then – maybe queens are less viable these days. You are right that the supercedure queen will have different genetics than the original queen. Maybe that’s not totally bad as the new queen will mate with local drones and might be more adapted to the new environment. I don’t know why the queen failed in my friend’s hive. She is fairly new to beekeeping (but learning fast). Something might have gone wrong the evening she put the bees in – squished queen, sick queen, agitated bees, queen flew away…. Yes, I have only experience with packages from my students who take up ferals after their packages failed for one reason or another—I can’t even say why as I never get to see the situation in situ or as it develops, but from their narrative, which is often difficult to interpret. I read on various bee chat groups that the supercedure tendency is very pronounced in package bees now, and the weakness to Vd (Vj) is high. And I have been a beek only 8 years, so no longevity to compare how things ever were, versus now. My early mentor has kept bees for 45 years—he bought his first colony from Montgomery Ward!! !, but he has kept only ferals the last 30 years. Yes— I think one is better off with the supercedure queen since your climate is going to be a lot harder for the bees compared to what climate they were raised in. I just consider the main reason a newbee buys a package is to get the genetics of the queen. Kind of expensive queen that may be lost—however, not much choice if the beek can’t get a swarm locally. From what I read, there is a lot of discussion about the failure of Queens due to rush to ship Queens that are not well mated. Sometimes too early in the season for good drone populations, sometimes concerns of pesticide contamination in use to control varroa and causing sublethal effects. What do you think or read about? Really interesting article, thank you Ron. Do you think the Canadian colony overwintering rate could be improved with different husbandry techniques, or is it just a case of being really flipping cold?! Canadian overwintering has been about 2/3 successful lately. I’m not sure that the issue is entirely due to the flipping cold – winter is very long here, usually with no pollen from mid-October to mid-April. That’s six months. To escape the cold, some beekeepers lock their hives in man-made thermal-regulated caves (wintering sheds). Most beekeepers winter outdoors and put lots of insulation around their hives. Either way, the colonies are sheltered so temperature hasn’t been the biggest issue. Weather, of course, is a factor – poor, late springs can be deadly. Length of winter is harder to fight, though stimulation feeding offsets that somewhat. Having said this, it seems that Canadian wintering losses aren’t much higher than many warmer places. The bigger problem has been the economics of bee replacement for lost over-wintered colonies and for expansions. Beekeeping has lately been on an uptick in Canada, going from 620,000 colonies in 2010 to 789,000 in 2017. That’s 170,000 new hives in seven years – many from packages. Beekeepers always try to winter their hives here, but making up for winter losses and expanding outfits has often meant bringing in packages. Some nucs are produced in Canada, but unfortunately, not enough to fill the gap. Colonies are also regularly split to make replacements, but in bad wintering years with late springs, the wintered hives often can’t quite make up the difference. Thanks Ron – I often feel guilty as you leave me such long, lovely fact filled answers to my questions! The numbers certainly contradict the news stories warning that honey bee numbers are dropping, even if the numbers are being helped by imported bees. No pollen from mid-October to mid-April is quite a thing when you think about it. We have pollen here by February and bees hardy enough to fly in mid-winter, like buff-tailed bumble bees, can find a few flowering plants in December and January, such as Mahonia.